This is a sponsored conversation written by me on behalf of Ashworth. The opinions and text are all mine. The numbers are staggering. According to The Institute for College Access and Success, over 70% of graduating students are carrying student loan debt – an average of $37,000 and a total of over $1.3 trillion! The delinquent balances for these loans are in the billions. The ability to get full-time employment that offers a decent salary and benefits is a shadow of what existed twenty years ago, and many employers are demanding higher degrees for jobs that don’t seem to warrant them. This makes make ask, why do you want to get a degree again? Although college seems like a straight line to debt and hardship, the issue of worth is not so black and white. There has always been value in personal growth and education, and the reality is, employers are still looking for candidates with certifications and degrees. While the economic challenges of the Great Recession have permanently changed our nation and our perception of debt, some educators are paying attention to the challenges that potential students are facing. With that said, pursuing a higher education may still be a good idea. Let’s explore! As the demand for degrees increased, institutions started developing more and more programs to meet demands as well. As employers started requiring higher degrees, the number of professional students also saw a significant rise. Schools saw the need to create more options for people who work full-time. Many colleges started offering more programs that could be completed in the evening and online to fulfill the rising demand. The great thing for students is that with online offerings, comes more choices and competition for your dollars. And with institutions being aware of the trepidation of modern students to enter into student loan debt, some have begun to incorporate greater payment flexibility while adjust their pricing to reflect the rise of online competition. That’s not to say that higher education is cheap, but you can now shop around and easily compare costs from one college to the next, allowing you to make a more educated choice when it comes to cost. Ashworth College, for example, prides itself on offering tuition rates approximately five times less than other online institutions. They also offer monthly installments at zero percent interest. These types of financial options, from an accredited and respected institution, is a game-changer for a person who is considering cost while not willing to sacrifice a quality education. According to the Bureau of Labor Statistics, a large majority of jobs don’t require certification or a college degree. The thing to consider though, is that these jobs are more prevalent in certain locations and are financially limiting. The fact is, the cost of living in New York is very different than living in South Dakota, and you will need a professional degree (or multiple jobs) to help you afford to live there. One way to make more money is still by furthering your education. The desire to get that next promotion is the reason why there are so many professional students today! Keep in mind though, higher education does not always need to be a degree program. By pursuing a certificate or career diploma within your field, you can show employers that you care about being on the cutting edge of your area of expertise. In my own life, even though I have an MBA, when I entered the Human Resources field, I sought certification as a Senior Certified HR Professional to help my ability to go up the ladder of my chosen field. This makes me more marketable if I move and need to find employment in a different part of the country. If you are an entrepreneur, sometimes that piece of paper can help to further your business. Even though you have the experience and expertise, a lot of people value credentials. Getting certified or a degree in your area, then adding those few letters behind your name, could make the difference between you and a competitor. Many students enter college with no idea what field to pursue, and honestly, many graduate the same way. Liberal Arts degree anyone? Sometimes where we start in a career is not where we end up when we discover a passion along the way. I am a perfect example! I have a Bachelor of Science in Biology, but you won’t find me a in a lab or out in the field doing biological studies. With additional education, you can more easily pivot from the road that you’re currently on, into a career or field that you would like to be in. college major, does not have to stick with you when you’re a 30-year-old adult whose interests and life circumstances have changed. p to a new career. I have never let go of one branch before grabbing another, and believe me, I have completely changed careers a number of times. Some fields of study don’t even require a degree and can be lead you to an entirely new career in just a few months. Take for example Computer Service Repair Technicians. Certification can be completed in as little as four months and the Bureau of Labor Statistics states that the mean hourly wage for this role is $18.95 per hour. Not bad for a few months of work plus passing a certification test. I will be the first to admit that when I completed my MBA, there was a period of time when I thought that I had added an additional $35,000 onto my college debt for no reason. I did not immediately see a bump in my salary or marketability. But in reflecting on my career, just two jobs after earning my degree, my base salary had increased by 50%! That’s pretty significant. The Social Security Administration counts your earnings from age 20 to age 69 in the numbers above. Even taking college debt into consideration, the difference in earning potential on a cumulative basis is humongous. 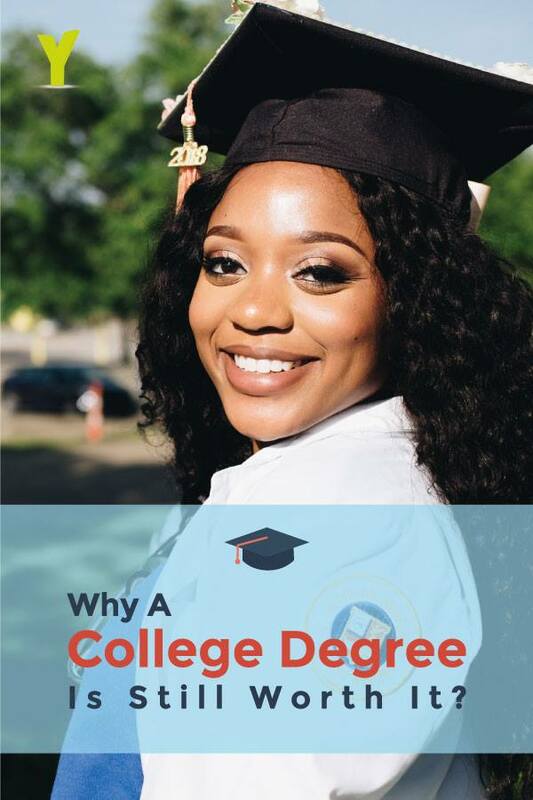 If you can acquire a college degree at an affordable price, the investment is more than worth it based on the returns that you will gain just on your earning potential alone. Institutions like Ashworth College pride themselves on being affordable while delivering a high-quality education. Furthering your education can be worth it if the decision to pursue it is made using financial wisdom and with prudent planning. Don’t throw the baby out with the bath water. If a degree or certification is the right option for you, there are affordable ways to attain it. ← So, We’re Pregnant and it’s Expensive! I agree college gets bashed often today. However, if you go for the right reasons and do it in a way that doesn’t cost a crazy amount of money it is well worth it. I earned a Legal Administrative diploma. So, just with Diploma in hand, I immediately moved on the a better paying job, as a backup receptionist. If I had gone to university, I would have been a lawyer, making enough money to not drag out my student loan for 7 years! Regretted not going to University for the last 20 years. Now insisting my kids go to university. Chris, you may have misread. I didn’t say that a college degree wasn’t worth it. I did state that in some cases, even just having a diploma or certification was better than nothing. Many coding jobs don’t require a degree and pay extremely well. I totally agree with you. Thanks for sharing valuable post. I really appreciate with you.